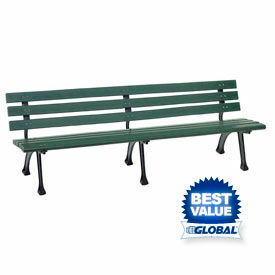 Plastic/Recycled Plastic Benches With Supporting Back Are Convenient Outdoor Seating For Parks And Gardens. Benches are made from tough recycled plastic for lasting durability and UV, moisture and scratch resistance. Made to endure the outdoors for years with virtually no maintenance. 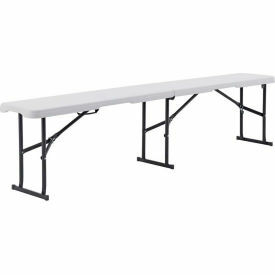 Available bench frames are Metal And Recycled Plastic. Benches can be In-Ground or Surface Mounted. Colors are Blue, Brown, Cedar, Gray, Green, Red, Simulated Wood, and Tan. Dimensions vary per model. Recycled Plastic Park Benches Provide Comfortable And Durable Furniture For Gardens, Recreation Areas, Transportation Stops And More. Recycled Plastic Park Benches feature a vandal-resistant design and do not need to be sealed, painted or stained. UV-protected rot-resistant plastic construction ensures long lasting reliability and protection. Available bench and frame colors include Aqua, Black, Brown, Cedar, Green, Red, Teak, Toffee, Weathered Acorn, White, and Yellow. Dimensions vary per model. Recycled Plastic Benches Provide Maintenance-Free Seating For Parks, Schools, Courtyards And Other Outdoor Venues. Recycled Plastic Benches may be installed in outdoor venues with no need to be sealed, painted or stained. Recycled Plastic Benches are vandal-resistant and will not rot. UV protectant ensures lasting durability even in direct sunlight. Inground and surface mount options available. 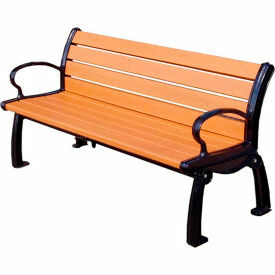 Recycled Plastic Benches are available in a variety of sizes, colors and styles. Dimensions vary per model.